With just two days to go until the Tour of Flanders, we look at how the new route reflects the changing face of cycling as a sport. One thing is certain. The Tour of Flanders will always be the Tour of Flanders. The route has been changed significantly amid howls of protest, mostly from the people of Geraardsbergen, whose famous Muur will stand idle this weekend. Traditionalists have every right to mourn the absence of the Muur. It has been an integral part of the race for almost 40 years. The character of the event may well be altered beyond recognition, although for all the pontificating about the likely effect the route changes will have, we won’t know for certain until we see how it unfolds on Sunday and over the next few editions. We do know that the heartbeat of the Tour of Flanders will always remain its cobbles and its sharp, repeated hill climbs. Things change and there’s nothing wrong with that. 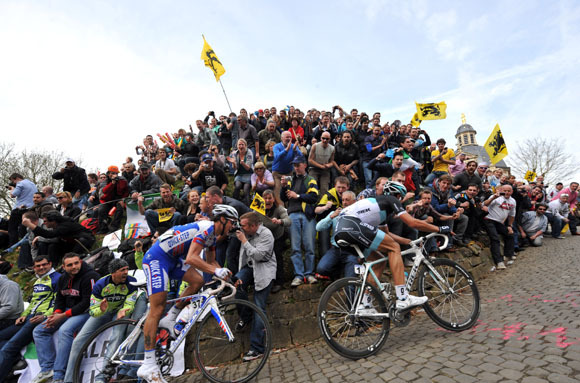 The Tour of Flanders thrived before the Muur and it will do so without it. And in the future, the Muur will surely appear again. But the changes to the course, the inclusion of a fiendishly difficult circuit that requires the riders to climb the Oude Kwaremont and Paterberg three times in the final 70 or so kilometres, mean we are dealing with the unknown for the first time in a generation. As is the case with all the spring Classics, the pre-race excitement builds towards race day. Kortrijk, where Cycle Sport is based for the weekend, was already buzzing with cyclists on Thursday. Ahead of the Ronde, the form of the riders is assessed, contenders are weighed up against each other and the list of possible winners is reduced to barely a handful before a pedal is turned. Current form suggests Sunday’s race will be a showdown between Tom Boonen and Fabian Cancellara. It may well prove to be, although it does seem we learn little from history if we rule out the myriad other possibilities. After all, last year’s race was in Cancellara’s pocket, the winner’s cheque virtually banked, before the start, only for Nick Nuyens, who rode with an almost ghost-like quality throughout, to pick his moment to make a winning effort. You can read our account of last year’s most enthralling race here. Nuyens’ victory was proof, not that any was needed, that the biggest bike races often fall to those who wait. The epic nature of the Classics, and particularly the five Monuments (the Tour of Flanders is the second Monument of the season) leads to some misunderstanding about what the biggest one-day events are supposed to be about. As much as we like to think otherwise, panache is an optional extra, rather than a requirement. Nuyens hid, measured his effort and pounced, rather like Simon Gerrans did at Milan-San Remo three weeks ago. Plenty of people think that the Classics are no more complicated than a simple test of leg power but that has never been the case. Cancellara has a legion of admirers because his style is to try to leave his rivals behind, although it leaves him vulnerable to being heavily marked and then out-manoeuvered. The question Sunday’s race will answer is whether the people who plotted the new Tour of Flanders route have managed to retain the sense of drama that permeates even a mundane edition of the race. To my mind, a great Tour of Flanders reveals itself gradually over a long afternoon. The joy is in watching each phase of the race play out and then, at the end, replaying it in the mind to work out how the jigsaw of moves and counter-moves fitted together to produce the end result. Without falling into the trap of guessing how Sunday’s race will go, it does appear that the new route is an attempt to create some sort of Greatest Hits version of the Tour of Flanders. The Oude Kwaremont, though not particularly steep, is long and always stretches the peloton into a long line, even when it appears at a non-critical phase of the race. The Paterberg, with a dead turn at the bottom that kills a rider’s momentum, has the capacity to cause legs to lock. They are both integral parts of the race but in the past they have been two ingredients that have contributed to the overall feast. At the risk of stretching the analogy, everyone knows that the best bits of a Christmas dinner are the sausages wrapped in bacon. But they only work when combined with the turkey, the potatoes and, yes, the Brussels sprouts. Viewed purely on paper, three climbs of the Oude Kwaremont and the Paterberg looks a little unbalanced, like sitting down to a whole plate of sausages wrapped in bacon. Television, modern media and a growing audience have led to a shift in culture. To traditionalists, the essense of sport is suspense. We sit down to watch sport, whether it’s cycling or a football match, knowing full well that it may not live up to expecations. That is part of the deal. We know that for every 4-3 thriller, there are two boring nil-nil draws. Not every Tour de France can recreate the drama of the final day of the 1989 race. And even if it were able to do so, something intangible would be lost. Is the new Tour of Flanders route pandering to the ‘Boom!’ generation? Are we trading something that is beautiful, epic and fallible for guaranteed thrills so that more VIP places can be sold? Who knows? Sunday’s race may not even provide a definitive answer. Only over the coming years will be know if anything has been lost or gained. A look at the route, and knowledge of the hills, their difficulty and the lack of recovery time between them, suggests that Sunday’s Tour of Flanders may lack the subtly of recent editions. Cancellara and Boonen may well have the perfect battleground upon which to stage a duel. But if we recall the suspense of recent years, it would be a shame if all of that were lost in the quest for The Defining Moment. Think back to Stijn Devolder’s back-to-back wins in 2008 and 2009, both of which came as a result of the peloton’s obsession with the likely strength of his Quick Step team-mate Tom Boonen. Think of how certain teams (Sky in 2010, Garmin last year) misread the race, misjudged their effort and contributed to a rich and diverse tapestry. Maybe I am in the minority. Maybe lots of people find it disatisfying to watch a race that was not won by the strongest pedaller. And maybe I am prejudicing Sunday’s race before we have had a chance to see how the changes to the course influence proceedings. We don’t know how it’s going to turn out. We can assume it will be harder, we can guess that the number of contenders at the sharp end will be small. We can guess that it will favour the brutally strong. But anyone who tries to tell you with any certainty what is going to happen is making it up. We simply don’t know. And that is a very beautiful thing. 1999 – I went into a petrol station the day before the race. It was pouring with rain. I struck up a conversation with the cashier. He could not hide his glee. The terrible weather was, he assured me, perfect for a real Tour of Flanders and he hoped it rained constantly for the next 24 hours. 1999 – It didn’t rain on race day, at least not much. Standing in the finishing straight just after Peter Van Petegem had outsprinted Johan Museeuw and Frank Vandenbroucke. The look of utter bewilderment on Vandenbroucke’s face as journalists crowded in to ask why he hadn’t won has always stuck with me. 2001 – Watching the finale of the race in a bar halfway up the Oude Kwaremont. The crowd groaned when Gianluca Bortolami won. Not only was he Italian but it was clear from the facial expressions and the shrugs of the shoulders that the average fan didn’t think Bortolami was a true Flandrian. 2005 – Sitting in the crowd in the square at Kwaremont, which was evenly divided in its support for Tom Boonen and Peter Van Petegem. As soon as Boonen got clear and it was clear that Van Petegem was not going to win, it seemed the Van Petegem supporters switched allegiances pretty quickly. Victory does that to a man. 2008 – Being overtaken by a woman in her fifties on a horrible, draggy, cobbled false flat during the sportive. In my defence, she was riding an electric-assisted bike. 2009 – While standing in the square in Geraardsbergen, seeing a drunken man in a Quick Step rainbow jersey and Molteni cap, hugging a bottle of Jupiler like it were a baby with its bottle of milk. He could barely keep his eyes open. They start early on race day, it seems.